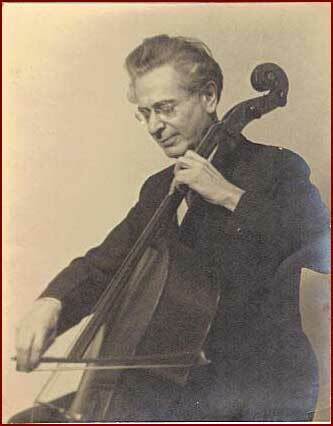 Having arrived with his family in England from Russia in 1891, Boris commenced his study of the cello with Herbert Walenn, and in 1898 was admitted to the Hoch Konservatorium in Frankfurt as pupil of Hugo Becker (cello) and Ivan Knorr (composition.) He also coached with the renowned Belgian violinist and composer, Eugene Ysaÿe. Following his debut in 1903 he made several concert tours of Europe, South Africa, Australia and New Zealand both a soloist and a member of the Hambourg Trio with his brothers Mark and Jan. In 1911 while Boris was performing in the United States, Leopold Stokowski offered him the position of Principal Cello with the Philadelphia Orchestra. He decided, however, to decline this tempting offer and continue his career as soloist and chamber musician. Settling in Toronto he helped establish in Hambourg Conservatory of Music. Upon the untimely death of his father Michael in 1915, Boris took over as director of the institution. His pupils included Marcus Adeney, Glen Morley, and Jim Hunter, who became head of the cello department at the Victoria Conservatory. While Boris devoted himself mainly to performing, he had several pupils who became highly successful teachers. One was James Hunter, who became head of the cello department at the Victoria Conservatory of Music and has left a legacy of brilliant performers and teachers from various parts of North America.